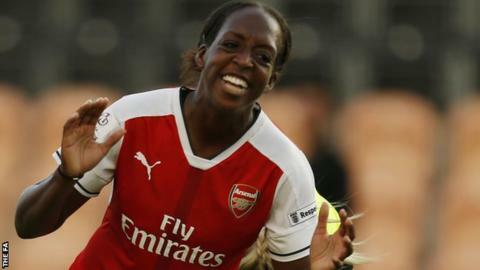 Arsenal striker Danielle Carter has signed a new "long-term" contract with the Women's Super League One club. The 24-year-old helped Arsenal win the Women's FA Cup in 2016, scoring the only goal of the final against Chelsea at Wembley. Arsenal have not disclosed the length of the deal. Carter has scored six times in her three senior international appearances for England so far, netting separate hat-tricks against Estonia. She made her Lionesses debut in 2015 but was left out of Mark Sampson's squad for the recent Women's Euros. "Danielle is an incredible asset to our team and has been for many years now," manager Pedro Martinez Losa told the club website. Carter added: "I am so happy to have signed a long-term contract with Arsenal. I love this club and I feel that I belong here. "I want to win trophies and be the best that I can be, and I believe that I can do that here as an Arsenal player."